One of the most important issues businesses must be sure to address is ensuring that the business is organized. It is important to maintain an organized plan for managing your documents. Your business can flourish when it is set up to keep track of records as well as remove and destroy them when their usefulness is over. If you have a system that is right for you, your employees will spend their time doing what matters rather than chasing elusive records. 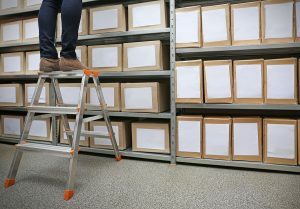 Whether your business is storing your documents onsite, offsite at a secure location, or in cloud storage, everyone in the company must know how to locate and organize your documents. Get Free Quotes on a Document Management Plan Today! We have locations all across the United States to serve your document storage needs. Fill out the form to the right, or give us a call at (866) 385-3706. Within minutes of receiving your request, you will have free quotes from experts in your area who can help you. If you’d like to learn more about document management, visit our articles section or check out our blog.